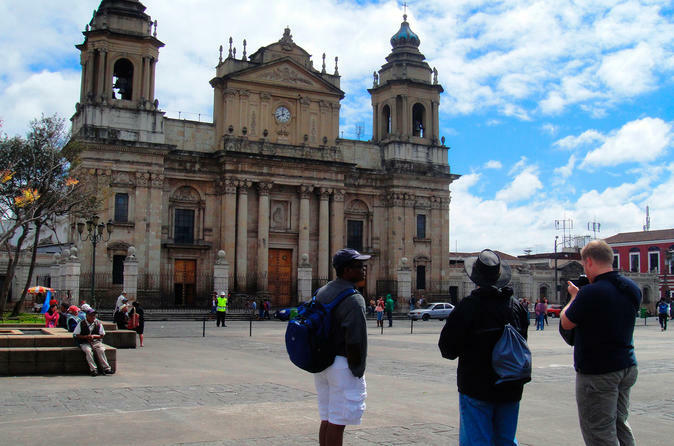 See Guatemala City’s top attractions on an afternoon sightseeing tour. It’s a great way to orient yourself with the city, and it keeps your morning free! Tour the largest city in Central America with a local guide to see important landmarks such as the National Palace of Culture, Metropolitan Cathedral, the Civic Center and the Bank of Guatemala. Hotel pickup and drop-off is included for your convenience with optional stay at Paseo Cayala (drop-off not included). After hotel pickup, your tour of Guatemala City — formally known as La Nueva Guatemala de la Asunción — begins on Avenue of the Americas (Avenida de las Américas), named after the formation of the Organization of American States in 1948. Then continue to the city’s Civic Center (Centro Cívico), where many buildings built in the 1950s and ‘60s buildings stand. Pass by the Supreme Court, Ministry of Public Finance, City Hall, the Guatemalan Tourism Commission and the National Mortgage Bank. At the Bank of Guatemala, take notice of its high-relief murals depicting Guatemalan history by artist Dagoberto Vásquez. You’ll also see a mosaic by Carlos Mérida, a muralist and printmaker whose works combined modernism with Latin American themes. Next, head to Constitution Plaza (Plaza de la Constitución), the heart of the city’s historic center. Admire its surrounding landmarks such as the National Library, the National Palace of Culture (Palacio Nacional de la Cultura), and the Metropolitan Cathedral (Catedral Metropolitana that was originally built in the late 1700s. The Central Market (Mercado Central) is out next stop, located behind the cathedral, where you can shop for art and handicrafts from around the country. It’s a great place to pick up ceramics, leather, textiles and jewelry to take home as souvenirs or gifts. Finish your afternoon enjoy a panoramic visit of Paseo Cayala and if you wish, you can stay here to enjoy a delicious dinner (not included). If you decide to stay, you will be able to enjoy your evening here and make your own way to your hotel when you are ready. If you decide to leave after the visit to Paseo Cayala, your tour ends with drop-off at your hotel.